Designers often need to convert photos in various quality vector graphics for further processing. 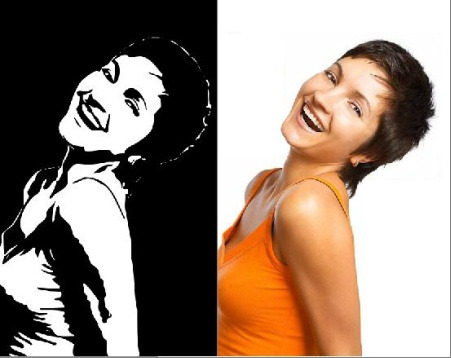 Recently, however, vector graphics is becoming popular among Amateurs, for example, sometimes users to effectively translate the photo into monochrome vector. Open the original in Photoshop. You need to figure in the photograph, which you will handle, was on a white background. If you do not have a photo of this type, remove the background using the program options (eraser or magic wand). Use the selection shape, and then copy what you have selected for application to a new layer. Rename this layer "figure". Create a new layer and give name "background". On the panel, move the layer so that its position was below the "figure" layer. Merge the two layers we get a layer named "Base". Then, apply to a "Main" layer tool "threshold value", in order to obtain the silhouette of a black-and-white composition. Next, you need to apply to the layer "Base" correction "threshold value" to black-and-white silhouette. Apply (Image – Adjustment – Threshold), the translation of the Image – Correction – threshold value. Next, use the filter "Diffuse" to smooth the edges. (Filter – Stylize – Diffuse Filter — Stylize — Diffuse. Now, in order to convert the edges of the pattern shape apply (Image – Adjustment – Levels) Image — Correction — Levels, bliste left and right sliders closer to the center. For normal adjustments, image zoom up to 300%. Apply the technique to the layer called "Основа_1". To do this, use (Image – Adjustment – Threshold), the Image — Correction — threshold value. Generate repeat step 4 for "Base _1". Create a new layer and fill it with black, then place to the place below the layer "Base". Change the blending mode for the layer "Основа_1" next Difference(Difference). It turned out not quite beautiful option, but it is possible to fix. A Base layer" used as the active layer, add a layer mask. Using the eraser, remove unwanted parts of the face of the girl. Select visible layer "Основа_2". Apply the threshold value so that the eye has acquired a better shape. Next, you need to repeat step 4. Apply the Lasso and select the area of the eye, to be converted to a layer mask. Select the entire black area with the Magic wand tool. Next, go to image RMB to open the menu Vyberte "to Form a working circuit". Next, contact a (Edit - Define Custom Shape) Editing — an Arbitrary figure. Give the name for the figure and save it.